Welcome to the Vatican. But I believe that this hall [that of the Synod] is in the Vatican only when there is the Pope, because it is on Italian territory. Also the Paul VI Hall Thank you so much for your presence to inaugurate this day of Mary Mother of the Church. We say from our heart, all together: "Monstra te esse matrem". Always: "Monstra te esse matrem". It is prayer: "Make us feel that you are the mother", that we are not alone, that You accompany us as a mother. It is the motherhood of the Church, of the Holy Mother Hierarchical Church, which is gathered here ... But that she is a mother. "Holy Mother Hierarchical Church", so liked to say to St. Ignatius [of Loyola]. May Mary, our Mother, help us so that the Church may be a mother. And - following the inspiration of the fathers - that our soul is also a mother. The three women: Mary, the Church and our soul. All three mothers. May the Church be Mother, that our soul be Mother. I thank you for this meeting that I would like to be a moment of dialogue and reflection. I thought, after thanking you for all the work you do - it's enough! -, to share with you three of my concerns, but not to "beat you", no, but to say that I worry about these things, and you see ... And to give you the word so that you address all the questions, the anxieties, the criticism - it is not a sin to criticize the Pope here! It is not a sin, it can be done - and the inspirations you bring into your heart. The first thing that worries me is the crisis of vocations. It is our paternity that is at stake here! Of this concern, indeed, of this haemorrhage of vocations, I spoke at the Plenary of the Congregation for Institutes of Consecrated Life and Societies of Apostolic Life, explaining that it is the poisoned fruit of the culture of the provisional, relativism and dictatorship of money , which remove young people from the consecrated life; next, certainly, to the tragic decrease of births, this "demographic winter"; as well as scandals and lukewarm testimony. How many seminaries, churches and monasteries and convents will be closed in the next few years due to the lack of vocations? God knows. It is sad to see this land, which for many centuries has been fertile and generous in giving missionaries, nuns, priests full of apostolic zeal, together with the old continent to enter into a vocational sterility without seeking effective remedies. I believe he seeks them, but we can not find them! For example, I propose a more concrete - because we must begin with practical things, those that are in our hands -, I propose a more concrete and generous sharing fidei donum among the Italian dioceses, which would certainly enrich all the dioceses they give and those they receive , strengthening the sensus ecclesiae and the sensus fidei in the hearts of the clergy and of the faithful. You see, if you can ... Make an exchange of [priests] fidei donum from one diocese to another. I think of some dioceses of Piedmont: there is a great aridity ... And I think of Puglia, where there is an overabundance ... Think, a beautiful creativity: a fidei donum system within Italy. Someone smiles ... But let's see if you are able to do this. Second concern: evangelical poverty and transparency. For me, always - because I learned it as a Jesuit in the constitution - poverty is "mother" and is "wall" of apostolic life. It is a mother because it gives birth to it, and a wall because it protects it. Without poverty there is no apostolic zeal, there is no life of service to others ... It is a concern concerning money and transparency. In reality, those who believe can not speak of poverty and live like a pharaoh. Sometimes you see these things ... It is a counter-testimony to talk about poverty and lead a life of luxury; and it is very scandalous to treat money without transparency or to manage the Church's goods as if they were personal goods. You know the financial scandals that have been there in some dioceses ... Please, it hurts me very much to hear that a clergyman has been manipulated by putting himself in situations that exceed his abilities or, worse still, managing in a dishonest way "the small change widow". We have the duty to manage with exemplary, through clear and common rules, that for which one day we will give account to the owner of the vineyard. I think of one of you, for example - I know him well - that never, never invite to dinner or lunch with the money of the diocese: pay from his pocket, otherwise he does not invite. Small gestures, as a purpose in spiritual exercises. We have the duty to manage with exemplarity through clear and common rules for which one day we will give account to the owner of the vineyard. I am aware - I want to say this - and grateful that in the CEI a lot has been achieved in the last few years, above all, on the path of poverty and transparency. A nice transparency work. But you have to do a little more about some things ... but then I'll talk about it. And the third concern is the reduction and unification of the dioceses. It is not easy, because, especially at this time ... Last year we were about to take one, but those from there came and said: "The diocese is small ... Father, why are you doing this? The university has left; they have closed a school; now there is no mayor, there is a delegate; and now you too ... ". And one feels this pain and says: "That the bishop remains, because they suffer". But I believe that there are dioceses that can be merged. I already raised this question on May 23rd 2013, the reduction of Italian dioceses. It is certainly a pastoral need, studied and examined several times - you know it - even before the Concordat of '29. 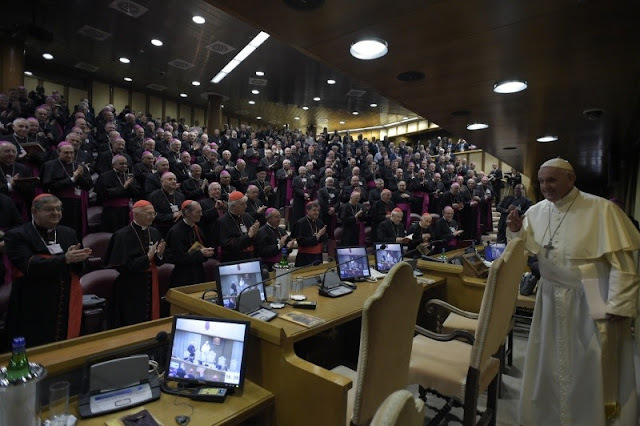 In fact, Paul VI in '64, speaking on April 14th at the Assembly of Bishops, spoke of "excessive number of dioceses"; and subsequently, on June 23, 1966, he returned to the subject again by meeting the Assembly of the CEI saying: "It will therefore be necessary to touch up the boundaries of some dioceses, but more than anything else we will have to merge many dioceses, so that the resulting circumscription has a territorial extension, a demographic consistency, an endowment of clergy and works suitable to support a truly functional diocesan organization and to develop an effective and unitary pastoral activity ". So far Paul VI. Even the Congregation for Bishops in 2016 - but I spoke about it in '13 - asked the Regional Bishops' Conferences to send their opinion on a project for the reorganization of the dioceses to the General Secretariat of the CEI. So we are talking about a dated and current topic, dragged for too long, and I think it is time to conclude it soon. It's easy to do it, it's easy ... Maybe there's a case or two that can not be done now for what I said before - because it's an abandoned land - but something can be done. These are my three concerns that I wanted to share with you as food for thought. Now I leave the word to you and thank you for the parrhesia. Thank you very much.